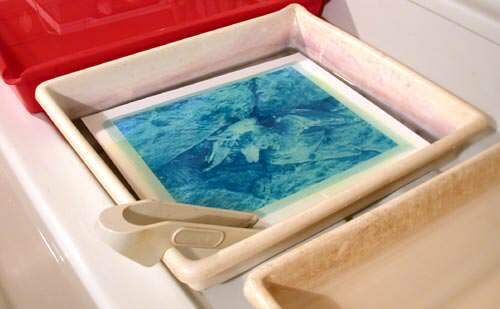 The cyanotype process, also known as the blue print process was invented by Sir John Herschel in 1842 and is still performed today by many darkroom enthusiasts. The 'traditional' cyanotype recipe, invented by Sir John Herschel in 1842, has the merits of being cheap, easy, and substantially non-toxic. 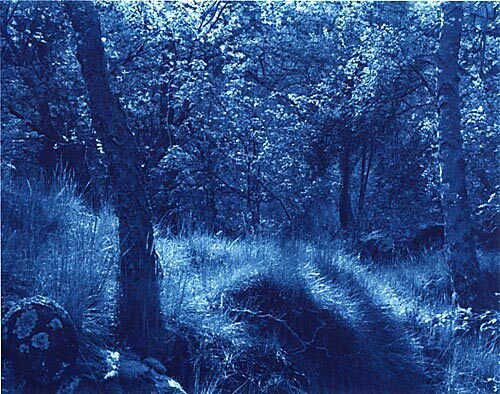 I also have a 'new cyanotype' process, which is more expensive and a little complicated to make up, but has several advantages, including superior quality. The former is suitable for newcomers to alternative processes, and children, but an experienced printer wishing to get the best result out of a fine negative should find the latter worthwhile. Here we look at both types in turn, but first for those who have no experience of iron printing please check out the first article in this series that explains what you need and how to prepare for the processing. Ammonium iron(III) citrate is also known as ammonium ferric citrate; its composition varies enormously and the 'green' form, with an iron content between 14% and 18%, is preferable to the 'brown' form (18-28% iron). Two stock solutions are required; their concentrations need not be exact and they are easily made up at room temperature as follows. These solutions must be stored in brown bottles. Dissolve 25g of the solid ammonium iron(III) citrate in ca. 70cc of distilled water and make up to 100cc. Dissolve 10g of the solid potassium ferricyanide in ca. 80cc of distilled water at room temperature and make up to 100cc. To use, mix equal volumes of stock solutions A and B to make a total volume of sensitizer appropriate for the amount of coating to be done. The mixed sensitizer only has a short life (days). It is best to dedicate a separate, labelled syringe or pipette to each solution, and to use a third one for applying the mixture, in order to avoid cross-contamination. As a guide to the volume needed for coating, about 1.5cc should suffice for a 10x8inch print, if coated by rod; but brush coating may consume possibly twice this. Although it is not part of the traditional formula, I would strongly recommend adding one or two drops of a 20% solution of Tween 20 wetting agent to each 10cc of sensitizer, to improve its absorption by the paper fibres; the appropriate amount depends on the chosen make of paper and should be found by experiment. Expose to sunlight or a UV lamp: the image prints out fully, with the uncovered regions of sensitizer first darkening to blue, but then reversing back to a pale blue-grey. The image shadows should be distinctly reversed, giving it a solarized look, and the high values should be green (the effect of colour-mixing the Prussian blue image with the residual yellow sensitizer). UV lamp exposure times may be around 20 to 30 minutes. The exposure is correct when the image appears quite 'blocked up'. The reason for this gross over-exposure is that about half the tonal scale of your print will disappear in the wet processing, as most of the Prussian blue in the high values is washed out. This loss in tonal gradation reduces the negative density range that can be successfully printed to only about 1.2, half that (ca. 2.4) of the 'new cyanotype' and the other iron-based processes. The traditional method therefore suits those who can only use negatives made for standard silver-gelatin (or gum bichromate) printing. Immerse the exposed print in gently running water (or several changes of static water), face down, until the yellow sensitizer has entirely disappeared from highlight areas (20 minutes should suffice). Substantial amounts of the blue image pigment will leach out and disappear with the washing water, so the washing necessary to clear the paper fully will greatly 'reduce' the image. The 'reversed' shadow tones will intensify during the drying, however, due to aerial oxidation of Prussian white to Prussian blue. If you wish to see the full density immediately, then immerse the print for about half a minute in dilute (0.3%) hydrogen peroxide (see below) before the final wash. This does not make any difference to the final dried-down densities. It is made up as a single stock solution which has a good shelf-life, does not nourish mould growth, and is very convenient to use. It is well-absorbed by paper fibres, so does not tend to lie on the surface, causing 'tackiness' which may damage negatives. The paper is also much better able to retain the pigment. Printing is much faster (ca. 4-8 times) than the traditional process. 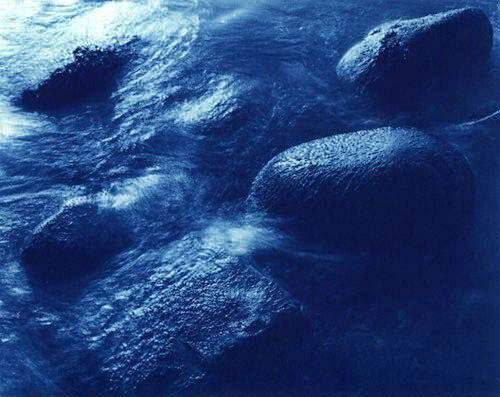 Very little of the Prussian blue image is lost in the wet processing; consequently a full negative density range (ca. 2.4) can be rendered in the print. Its disadvantages are a higher cost, more complicated preparation, and a toxicity (though no worse than kallitype or platino-palladiotype) that debars it from use by very young children. Analytical Reagent (AR)Grade(>99% pure) is preferred. Ammonium iron(III) oxalate is also known as ferric ammonium oxalate. Like all oxalates, it is poisonous. The preparation of this sensitizer solution calls for a little more experience in chemical manipulation than you need to make a traditional cyanotype sensitizer. This work should be carried out under tungsten light, not fluorescent or daylight. A hotplate will be found most convenient for heating the solutions, but a basin of hot water will do. 1 Measure 20 cc of distilled water into a small pyrex glass beaker, heat it to ca. 70 C, and completely dissolve 10 g of potassium ferricyanide in it, with stirring; keep the solution hot. 2 Measure 30 cc of distilled water into a second beaker, heat to ca. 50 C, and dissolve in it 30 g of ammonium iron(III) oxalate. 3 Now add the hot potassium ferricyanide solution to the ammonium iron(III) oxalate solution, stir well, and set the mixture aside in a dark place to cool and crystallise, until it just reaches room temperature (ca. 20 C; for this quantity of solution, the cooling will take an hour or two). 4 Separate the liquid from the green crystals by decanting and filtration (Whatman grade 1 filter paper is adequate). The green crystals (potassium iron(III) oxalate) should be disposed of safely because they are poisonous. The volume of filtrate extracted should be ca. 55-60 cc. 5 Make up the filtered solution with distilled water to a final volume of 100 cc. Mix well. 6 Store the sensitizer solution in a well-stoppered, clearly labelled brown bottle. Kept in the dark, at room temperature, its shelf life should be at least six months. NB This sensitizer solution is poisonous (much more so than traditional cyanotype) and it will obviously stain skin, wood, clothes, textiles, household pets and any other absorbent surfaces. NB If your chemicals are of high purity, the sensitizer solution you obtain will be yellowish-green. But if there are significant amounts of iron(II) impurities in your chemicals, it may be coloured blue due to a trace of Prussian blue formed in suspension. 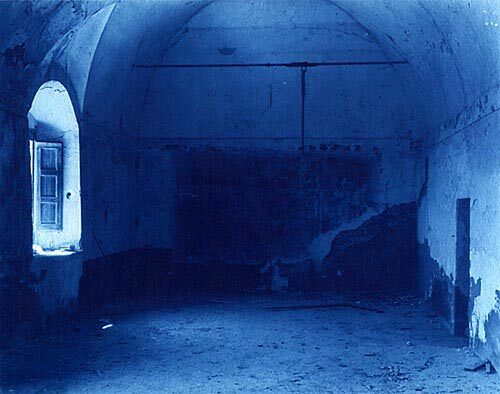 A strongly blue-coloured sensitizer can stain the high values of your prints, so, before use, allow such a solution to stand in the dark for a day or two, after which time the Prussian blue should have flocculated and settled out as a dark blue precipitate, leaving a clear green solution above it. Now re-filter the sensitizer before use. Alternatively, you can make use of dichromate to prevent formation of the blue colour, as follows. If the impurities in your chemicals are sufficient to cause a strong blue coloration in the mixed sensitizer, then this can be avoided by the addition of ammonium (or potassium) dichromate. However, the presence of this reagent will tend to increase the contrast of the sensitizer significantly. To the solution at stage 2 above, add 0.1 g of solid ammonium dichromate, and dissolve it. You should recognise that this does introduce a very toxic substance, albeit in very small amount. The addition of dichromate extends the shelf-life of the sensitizer almost indefinitely. The new cyanotype sensitizer solution is much more readily absorbed by paper fibres than the traditional sensitizer, so the addition of a wetting agent is usually quite unnecessary. With a few, hard-sized papers such as Buxton, however, the wetting agent can improve the ease of coating and the retention of Prussian blue by the paper fibres. In such cases, I prefer Tween 20(tm) (a non-ionic surfactant) which may be added to the sensitizer solution to produce a final concentration of ca. 0.1% to 0.5%. A stock solution of concentration 20% v/v , which keeps well, is useful for this: if you find it necessary, add one or two drops per 10 cc of sensitizer and mix well just before coating. The appropriate amount will depend upon the paper, so do not add it to the bulk of the stock sensitizer solution: Tween may interact unfavourably with some gelatin-sized papers. The new cyanotype sensitizer provides a delicate test of paper quality - especially if the coated paper is left for some hours in the dark at normal relative humidity: any change of the lemon-yellow coating towards a green or, worse, blue colour is an indication of impurities or additives in the paper that are hostile to this process (and possibly to other processes as well). Try to use a paper with as little additive as possible, e.g. Buxton or Silversafe. Expose the sensitized paper within a few hours of coating, if possible. It makes no difference whether the paper is heat-dried in warm air for a few minutes, or dried at room temperature for at least half an hour. Its storage life depends on the purity of the paper base, but it will keep longer in a desiccated enclosure. The coated side should remain yellow or yellow-green; if it has turned blue the highlights will be chemically fogged, so it must be rejected, and a better paper found. Exposure will be much shorter than that needed for the traditional cyanotype recipe - this new sensitizer requires about one minute in bright sun or four minutes under a typical UVA light source. Continue the exposure until the high values appear pale green, the mid-tones are blue, and the shadow tones are beginning to 'reverse' to a pale grey-blue, giving the image a partly solarized appearance. The exposed paper can be processed most simply with gently running tap water for at least twenty minutes; alternatively, several static baths may be used. 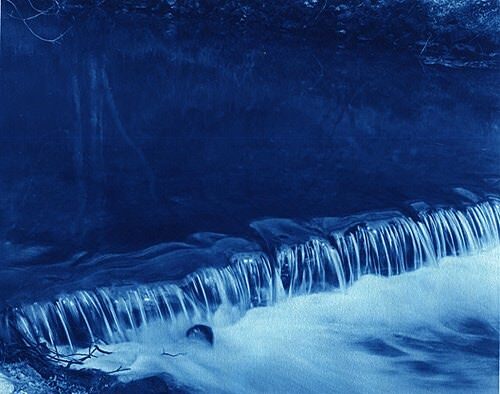 The water should not be significantly alkaline, which destroys Prussian blue, but preferably have a pH below 7. It is important to avoid using 'hard' water, because calcium ions interfere. However, a stronger result altogether can be obtained by processing first in a 'development' bath of very dilute mineral acid: a deeper maximum density is obtained with a long printing exposure range of about 2.4. Hydrochloric acid or nitric acid are best, at a strength of about 1%, i.e. the usual concentrated acid is diluted about 100 times (10 cc to a litre of water): be sure always to add the acid to the water, not vice versa, and take precautions to protect your eyes and skin and lungs from the concentrated acid. In the interests of safety, a lesser dilution of a more dilute stock solution of acid may be preferred. The diluted 1% bath is not dangerous; but if you baulk at using these mineral acids, then dilute citric or acetic acid (vinegar) will also work to some extent. The print need remain in this bath for no more than about half a minute. By varying the acidity of this processing bath, considerable control of the contrast may conveniently be achieved at the development stage. The development bath tends to accumulate Prussian blue, which will eventually begin to stain the paper, so it should be replaced after a few prints have passed through; typically, 1 litre will process five to ten 10 x 8 inch prints. Finally wash the print gently in running water for at least 20 minutes. The criterion for completed processing is the total removal of the yellow stain of sensitizer from unexposed areas - hold the print up to a bluish light, or view it through a blue filter, to check for stains in the interior of the paper; if any stain persists, further washing is required. Unlike prints made by the traditional recipe, there should be very little loss of image substance during this washing. The reversed shadow tones begin to regain their values quite rapidly during the wet processing (nitric acid particularly assists this), and they will recover fully during drying in the air. If you are anxious to see the final result immediately, then immerse the print in a bath of 0.3% hydrogen peroxide for no more than half a minute before transferring to the final wash. This solution of hydrogen peroxide is made up freshly by diluting 50 cc of the commonly available 6% solution of hydrogen peroxide (the so-called '20 volume' solution) to 1 litre of water. This treatment, although apparently spectacular, makes no difference to the print densities in the final outcome. John Barnier (Ed. ), Coming into Focus: A Step-by-Step Guide to Alternative Photographic Printing Processes, San Francisco: Chronicle Books, 2000. Richard Farber, Historic Photographic Images, New York: Allworth Press, 1998. Mike looks at platinum-palladium printing. Mike Ware graduated in chemistry at the University of Oxford (1962) and obtained a doctorate by research in molecular spectroscopy (1965). 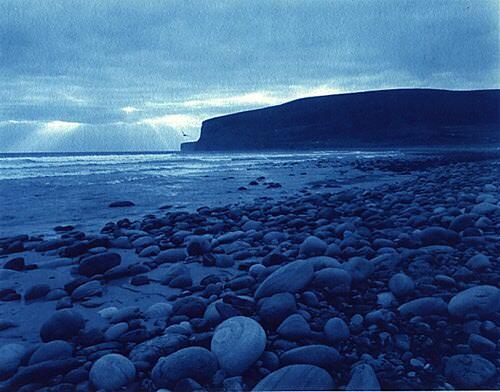 He became a Chartered Chemist and a Fellow of the Royal Society of Chemistry (1982) and now studies the science, history and art of alternative photographic processes. Mike acts as a consultant to the National Museum of Photography, Film & Television, Bradford, England, and has supervised postgraduate research in photograph conservation at the Victoria & Albert Museum and the Royal College of Art, and in alternative photographic processes at the University of Derby. Mike conducts specialist one-to-one workshops and masterclasses in alternative printing techniques throughout the country, and has appeared on BBC Televison in the Open University series The Chemistry of Creativity (1995). 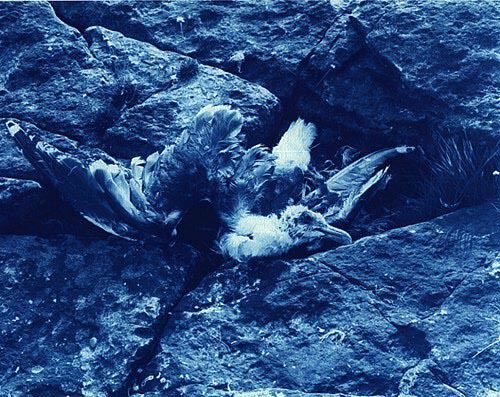 Mike also has two books published by the Science Museum, London (or NMSI as it is now known) Mechanisms of Image Deterioration in Early Photographs (1994) and the more recent Cyanotype: the history, science and art of photographic printing in Prussian blue (1999). He is currently working on his third book on Chrysotype. and will not have a uv light available. Have you any suggestions how I could jerry rig a cheap and portable uv light system suitable for a two workshop. I will be using pre-coated cyanotype fabric.